The recent heat wave was unexpected here in the cool Northeast. For most of us, "air conditioning" means opening the windows. How to deal with these awful temps? Someone I once worked with put it this way: "Do as the Europeans do-- walk slowly and smile a lot!" With a garden that is finally deciding to put out some edible produce and 30+ chickens to keep hydrated and pecking on clean grass, that's a tall order. So we garden and do animal chores in the cool(er) early mornings and hide behind shades with our fans going in the scorching late afternoons. A perfect time to clay (if you're not doing canes and processes requiring lots of clay-handling) and think about hot colors. I decided to make a couple of pairs of earrings that I could wear with my recent Solstice necklace. I re-visited my stringing method after wearing it, adding another strand of beads to counteract the tendency of the beads to flip around to the opposite side. I had originally put two holes in the clay pad on the back of the bead to accommodate two strands but the trick was to string the top strand first and THEN the bottom one. I use a necklace bust when I'm doing this, so I get the drape correct. I've found you just can't get it right by laying the necklace flat. Here are the shots of the earrings before I added the earwires. You may be able to see the texture in the wire, which is the new, fabulous Whim-Z Wire from Garlan Chain Company, which comes in bronze or copper and several textures. You can see the product and buy it in bulk spools at Rio Grande. The product's distributor says it will be available in smaller quantities at retail prices soon. Check here for updates. 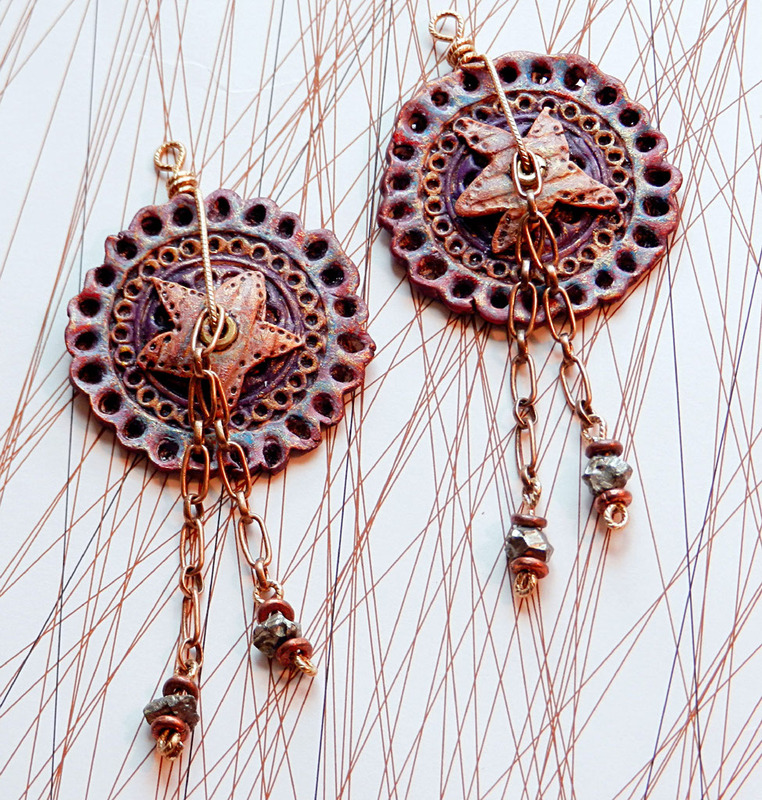 Here I've used "Nick" in brass -- my go-to wire lately for everything from my twisty-wire embellishments to earwires. It patinates very nicely with proprietary patinas or with heat. It's very pliable but has enough oomph to hold a single loop for components or charms. And it takes gilders paste beautifully. What's not to like?? After watching a great Good Eats episode on curry, I decided to name the red ones "Masala", which means "mixture" in the Tamil language. The Kashmiri earrings have dangles ending in my new favorite stone, pyrite chips. I love that the color's a cross between gold and silver and has a nice glint to it without overwhelming the polymer. Jeanette Blix from ArtBliss just told me I have a new registration for my class there in September. 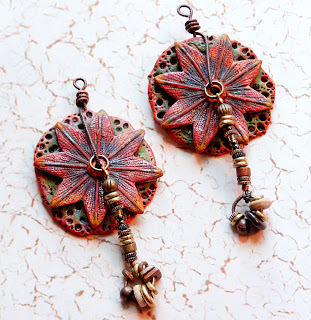 We'll be making earrings like these and exploring many other interesting coloring techniques as well. And be sure to check out the entire lineup of fabulous instructors. For mixed media fans, ArtBliss definitely has something for everyone! So very lovely. I can see these paired with a sweet little sundress and some strappy sandals. Stay cool, my friend! Try to stay cool - at least now I know where our summer is hanging out... because it hasn't been around here much.